Did you know....the 6th of December isn't Spanish Constitution Day? If you’d ever wondered about our name, Acantho I&C, it stands for “Ideas and Cultures”. The “Ideas” part represents our mission to accompany you by providing our linguistic consulting services and, of course, “Cultures”, because since we, as translators, seek to build bridges among different cultures. (And this is so important to us that our company logo actually represents text and speech bubbles). And just what does this have to do with the title of this blog? Well actually it’s because today we’re not going to talk about translation, sworn translation or simultaneous interpretation. It won’t harm us to do this just this once! Everyone, or at least everyone in Spain, knows that today we celebrate Constitution Day. But we’re not going to give you a class on the history of Spain because it’s quite probable that, given the events of these past months, it’s not a topic that you’re going to want to read about. So, moving on, we’ve decided to write about the culture and customs of some of our neighboring countries on the 6th of December. 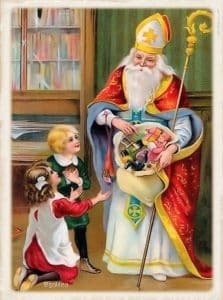 Many of our northern neighbours today celebrate the Day or Festival of Saint Nicholas. For some of them, such as The Netherlands and Belgium, this is quite an important festival. For others, such as Germany, Austrian, Poland, Switzerland, France and The Czech Republic, it’s more of an ancient tradition. 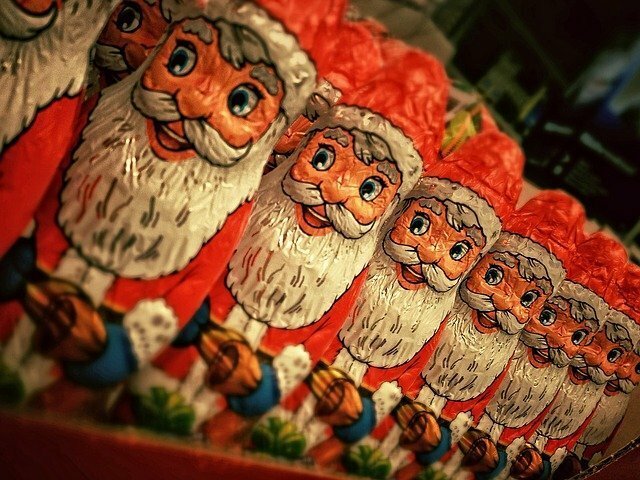 Saint Nicholas is a figure dressed in red with a long white beard. Sound familiar? He brings gifts to children on the 6th of December. During the night of the 5th to the 6th of December, children leave their shoes out in front of the chimney to receive presents. Saint Nicholas rides on horseback, or on a donkey, and goes from rooftop to rooftop with the help of his assistants delivering sweets and presents. In Holland, Sinterklaas, the patron saint of boats arrives by a steamboat filled with presents to the country’s coast on the 6th. This event is broadcast every year across the nation. And each city and village has an official time to receive him. But not everything is all happy endings and fairy tales. Just as the Three Kings here in Spain can bring us coal, the image of the white-bearded man has its punishing equivalent for bad children. Old Man Whipper (Père Fouettard) in France, Ruprecht in Germany … or Kamprus in Bavaria and Austria. This figure either walks alone or accompanies Saint Nicholas on the night of the 5th. He is also reminiscent of the bogeyman, who comes to take away bad children. 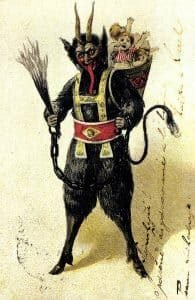 Krampus is a demon, always represented with a long tongue sticking out of his mouth, black hair, and horns coming out of his forehead. He comes to whip children who have behaved badly. So now you know. Be good!